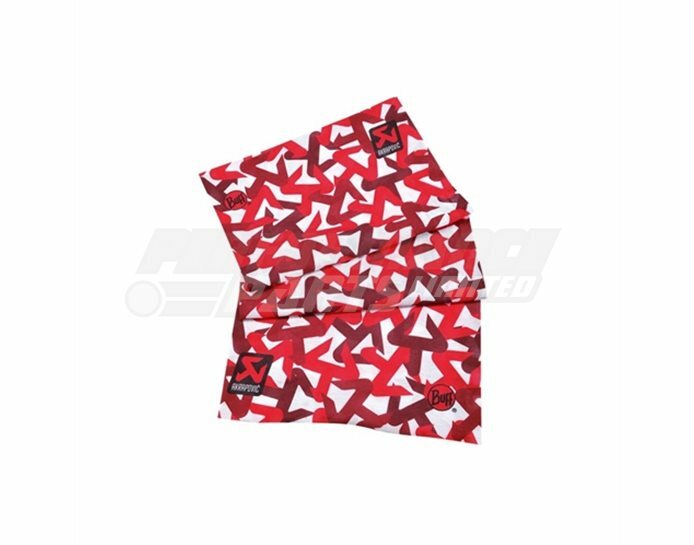 The co-branded BUFF® is a multifunctional tubular accessory ideal for many sports and leisure activities. Made from lightweight, breathable, microfiber fabric that offers protection against various weather conditions and is extremely comfortable to wear. You can express your Akrapovic brand loyalty with their range of Official Apparel. A pioneer in its field, Akrapovic is widely recognised as a highly innovative materials technology company. The Slovenian brand is synonymous with the highest level of design and performance enhancement. Akrapovic exhaust systems are developed by the same team of engineers who work with championship-winning partner racing teams in MotoGP, WSBK and many other race categories. The Racing R&D department works with dozens of racing teams. Over 90 world champions have already relied on Akrapovic exhaust systems. All products are produced and tested in the company’s own labs using their own highly advanced equipment. The company’s products are designed and manufactured by a passionate and highly-skilled workforce of over 800 employees using only the finest materials and latest technology. Significant horsepower increases – usually without the need to re-fuel . Massively reduced weight over standard. F.I.M or EC approved noise levels with a “quality” sound. Spare parts availability to maintain and protect your investment. 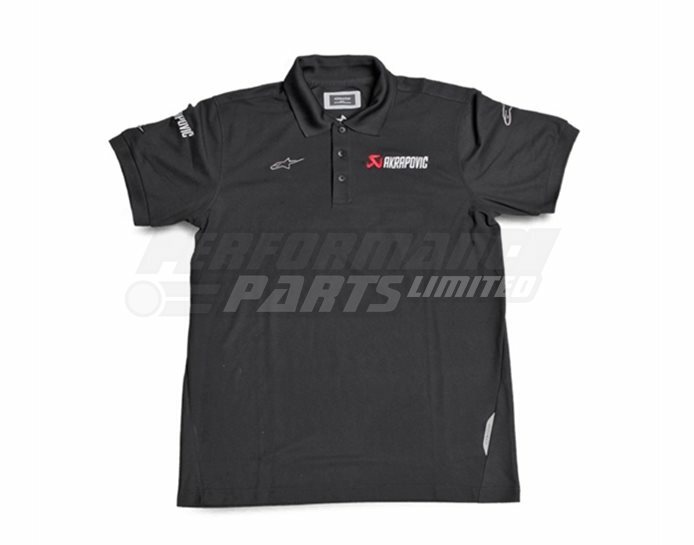 Perfectly tailored black polo shirt made of 100% polyester featuring the Akrapovic and Alpinestars logo embroided on the chest and back. Available in XS, S, M, L, XL, and XXL. 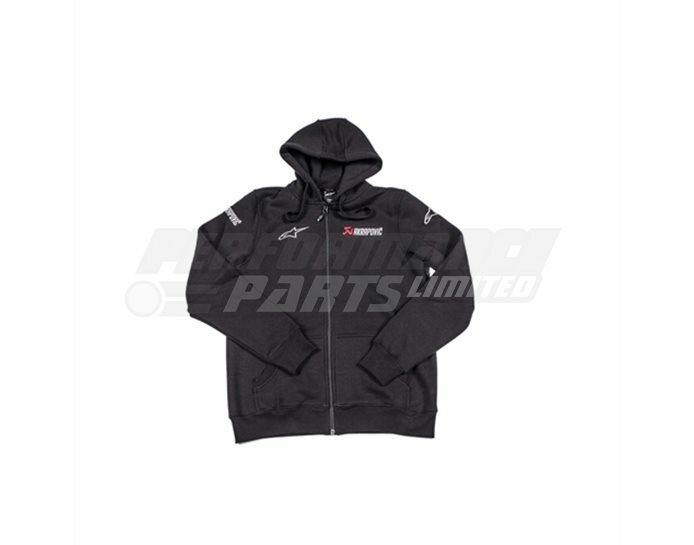 A zip-front fleece lined hoodie with embroidered Akrapovic and Alpinestars logos on front and back, made of 80% cotton and 20% polyester. Available in XS, S, M, L, XL, and XXL.